In this episode of the TiLT Parenting Podcast, I’m excited to share with you a conversation I recently had with filmmaker Tom Ropelewski. 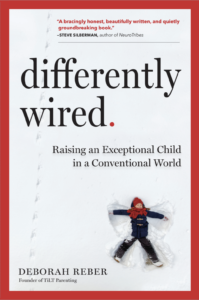 Tom is the director of the highly acclaimed documentary 2e: Twice Exceptional, which came out in 2015, and he’s currently wrapping up post-production on a follow-up film, called 2e2: Teaching the Twice Exceptional. Tom’s films center around Bridges Academy, a school for twice-exceptional kids in Studio City, CA that seems to have figured out the best way to meet the educational needs of these unique learners. In our conversation, Tom shares his story and personal why behind making these films, talks about the educational model at Bridges, describes how his films are helping to bring awareness of 2e kids’ into the mainstream, and gives us a sneak peek at his new film coming out later this year. About Tom: Thomas Ropelewski has written and directed for both film and television. He wrote and made his feature directorial debut with the Orion Pictures comedy MADHOUSE, starring John Larroquette and Kirstie Alley. Other film credits include LOVERBOY, THE KISS, LOOK WHO’S TALKING NOW and THE NEXT BEST THING. His television work includes serving as writer/executive producer for three seasons of Paramount TV’s action/sci-­‐fi series SEVEN DAYS. Recently, Ropelewski produced and directed the documentary, CHILD OF GIANTS: My Journey with Maynard Dixon and Dorothea Lange. The film has been screened at film festivals, colleges and museums around the world. It has also aired on KCET/San Francisco’s “Truly CA” documentary series. He currently resides in Berkeley, CA and is married to screenwriter Leslie Dixon (MRS. DOUBTFIRE, HAIRSPRAY, THE THOMAS CROWN AFFAIR, LIMITLESS). One Mind at a Time: America’s Top Learning Expert Shows How Every Child Can Succeed by Mel Levine M.D.